On April 16th, 2010 the Young Creatives Summit will be back and better than ever. Like in 2009, the 2010 Summit will provide new and creative ways to give young people a louder voice in the direction of the Dayton region. Also, new to the agenda this year will be workshops to give young creatives some of the tools they’ll need to be community leaders. The 2010 Summit promises to be an event you won’t want to miss. 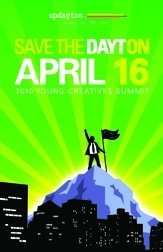 Save a spot on your calendar for the Young Creatives Summit on April 16th, 2010 at the Dayton Convention Center. This entry was posted on Saturday, November 21st, 2009 at 12:57 pm	and is filed under updayton. You can follow any responses to this entry through the RSS 2.0 feed. How young and creative do you have to be???? Beth – just bring a fake ID, I’ll vouch for you!! !